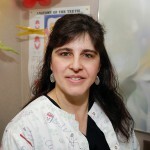 Kelly Janketic is our registered dental hygienist. Kelly attended New York City Technical College of Brooklyn where she received her Associates Degree in Dental Hygiene. She also completed a residency at St. Albans Hospital in Queens and Downstate Hospital in Brooklyn. Kelly is a member of the American Dental Hygiene Association.